Relax. 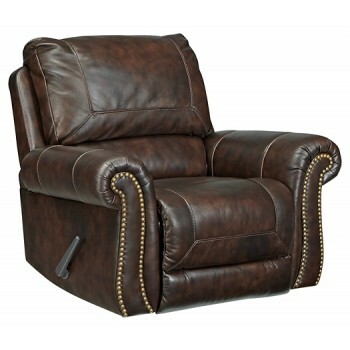 This rocker recliner is luxury made affordable. Sumptuous top-grain leather wraps the interior seating area, including armrests, while skillfully matched faux leather upholstery on the exterior saves you a pretty penny. Nailhead trim and rolled, padded arms are distinctive refinements to a classic profile.